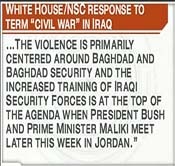 NBC Decides To Call The Violence In Iraq A "Civil War"
On the Today Show, NBC announced to the world that the violence in Iraq can now be labeled a civil war Monday morning.. NBC assured us that they didn't just come up with that label. It asked many people and held careful deliberations. Matt Lauer even took us through the definition of the phrase. 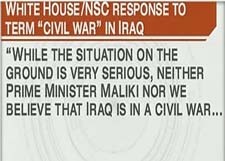 The White House refuses to believe their own eyes and will not call it a civil war because the violence is centered around Baghdad. Gee, only 25% of Iraq's population lives there. How quickly they forget about the rest of the violence in the country. Nice to see the crazy Hippies have already spoken on this issue.